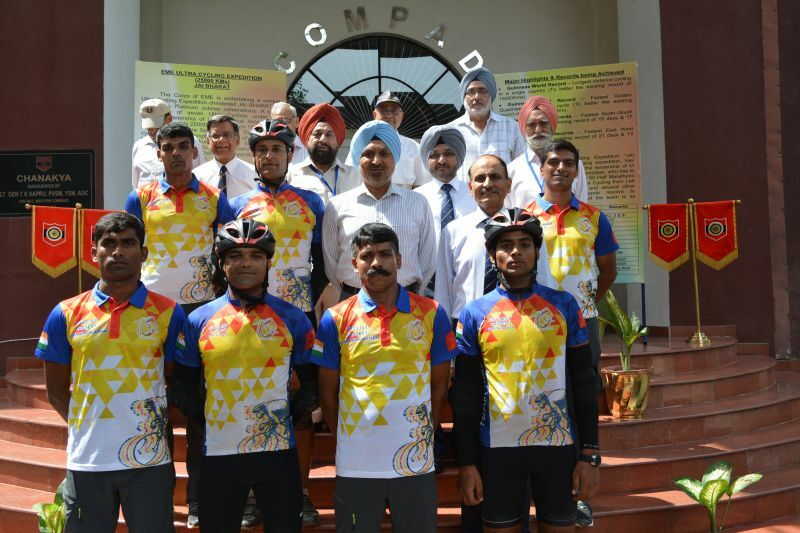 The Corps of Electronics and Mechanical Engineers of Indian army is undertaking a unique Ultra Cycling Expedition christened Jai Bharat as part of a celebration for its ‘Platinum Jubilee’. The team comprising of seven ultra-cyclists under Lieutenant Colonel Vishal Ahlawat, a Mount Everest summiteer and a passionate adventurist embarked on a gruelling 25,000 Kms journey across the length and breadth of the country. The journey is to be completed in three phases from Leh to Kanyakumari, Teju to Koteshwar and finally the Golden Quadrilateral: Delhi-Mumbai-Chennai-Kolkata-Delhi. The team plans to cover the entire distance in just 120 days to set four new world records. The expedition was flagged off from Military College of Electronics and Mechanical Engineering, Hyderabad on 15 Aug and is expected to be completed on 02 Dec at Delhi. The expedition team arrived at Chandimandir on 24 Aug after nine days of continuous cycling covering a distance of nearly 2000 Kms from Secunderabad to Delhi. The team was felicitated by Lieutenant General Surinder Singh, General Officer Commanding -in- Chief, Western Command. The Army Commander flagged off the team for their onward journey to Leh and complimented the team for undertaking this extremely challenging mission which symbolizes the forces’ indomitable spirit and resolves to overcome all odds to accomplish the assigned task.